Xiaomi is set to unveil the Redmi 4 at an event on November 4, which is this Friday. At least that's what is allegedly teased by the image you can see to the left. 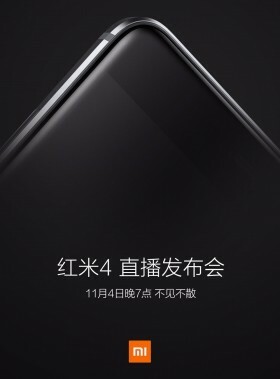 The teaser has been outed by Xiaomi today, and it shows the upcoming handset's top left corner, seen from the front. You can just barely make out the earpiece, while the 2.5D curved glass on top of the screen is very obvious. The metal construction is also a given considering what can be seen in the image. The Redmi 4 has been rumored to sport a 5-inch 1080p touchscreen, a 13 MP rear camera with dual-LED flash, a 5 MP selfie snapper, a Qualcomm chipset with an octa-core CPU, 3GB of RAM, 32GB of storage, a fingerprint scanner on the back, and a 4,000 mAh battery. It will reportedly be available in gray, silver, and gold (with the first of those color options pictured in the teaser, we assume). Price-wise this is set to be quite expensive compared to its predecessors, allegedly retailing for CNY 1,300 - which means $192 or €173 at the current exchange rates. Obviously though, it's still affordable enough for the specs it packs. Xiaomi should also launch the cheaper and lower-end Redmi 4A alongside the Redmi 4, at the same event in just a couple of days. They will both run the latest MIUI version on top of Android 6.0 Marshmallow.